h off SAVE 25-50% STOREWIDE! off SAVE 25 - 50% STOREWIDE! Pick an egg from our basket of savings to save off your entire purchase! Includes queen panel bed, dresser, mirror, and 1 nightstand. Alenya Recliner Available in 2 colours. Loveseat also available. Available in 2 colours. $ Alenya 2-PC Sectional 3-PC sectional, and ottoman also available. Available in 2 colours. Sommerford King Panel Bed Dresser, mirror, nightstand, chest, and Queen Size also available. Sommerford 6-PC Dining Set Includes table, 4 upholstered side chairs, and bench. *Featured flyer specials reflect discount and are subject to applicable sales tax. All financing is OAC. An administration fee and $21 annual membership fee may be charged to your Account subject to certain conditions. Financing provided by Fairstone Inc. and is subject to all the terms and conditions in your cardholder agreement and the credit promotional plan disclosure statement (collectively the “Account Agreement”). Finance Charges will not accrue on the purchase during the credit promotional period. The terms of the credit promotional plan will terminate if you default under your Account Agreement. On termination or expiry of the credit promotional plan (or for purchases that are not part of the credit promotional plan), the standard APR of 29.99% and the terms of the regular credit plan will apply to all outstanding balances owing. Valid starting 04/20/2019 and cannot be used for previous purchases and cannot be combined with any other offers, promotions or discounts. Certain terms and conditions apply. See store and Account Agreement for further information. Discount taken from the regular price. Discount offers exclude floor models, clearance items, value mattresses, sales tax, furniture protection plans, warranty, delivery or service charges. ** Free delivery applies to local delivery area. For out of town deliveries, a credit of $69.99 will be applied to the delivery fee and customer will be responsible for payment of the remainder. SEE STORE FOR DETAILS. Although every precaution is taken, errors in price and/or specification may occur in print. We reserve the right to correct any such errors. Prices valid for a limited time only. Picture may not represent item exactly as shown. †Durablend® upholstery features a Polyurethane/Leather blend (57% Polyurethane, 26% Polycotton, 17% Leather). HomeStores are independently owned and operated. 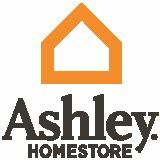 ©2019 Ashley HomeStores, Ltd. Limited time offer. 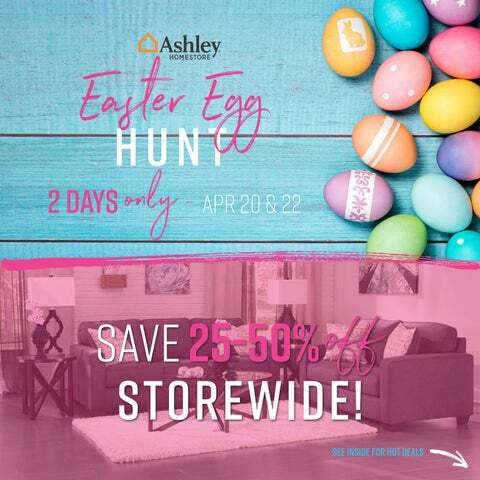 Ashley Easter Egg Hunt - 2 Days Only!